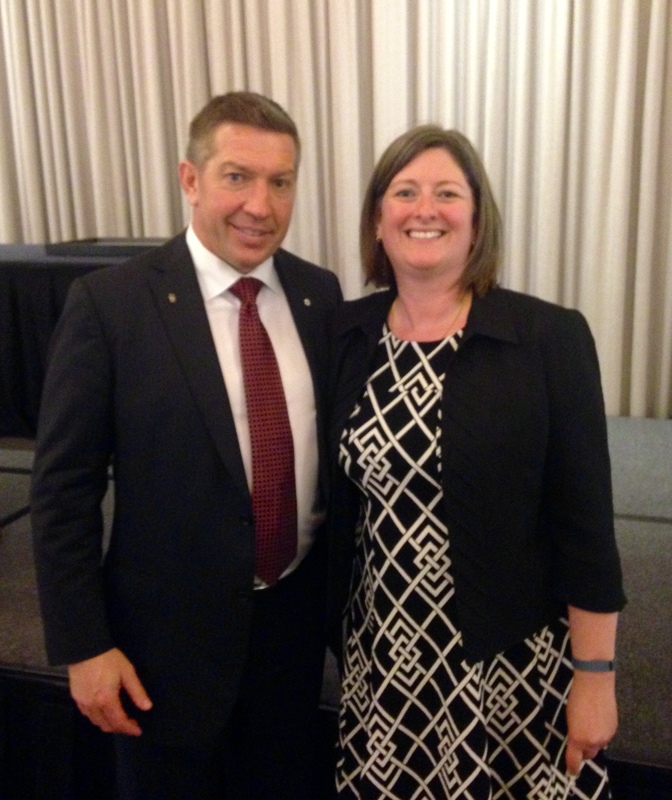 Even though I have not read Why I Didn’t Say Anything – The Sheldon Kennedy Story yet, I feel compelled to blog about the Lincoln Alexander Leadership Award (LALA) recipient. As a University of Guelph Alumni (MA Leadership program) I was honoured to attend the LALA dinner to recognize Sheldon Kennedy along with alumni from as far back last 2008 and current students of this fantastic program. Sheldon described leadership as “trying to be the best person I could be”. He marvelled that “this farm boy” was receiving an award! For those of you who don’t recognize the name, Sheldon was a successful hockey player but he has made a difference for victims of abuse across the county because he stood up, he shared his story, he was open about his mental health struggles and as he dealt with his challenges he acted selflessly to help others. He spoke about the challenges in bringing together professionals who are guided by different Ministries, often in silos to help a child and reported that “it is all about relationships”, about “understanding between systems” and “how we can work together“. For those of us working in health care, we understand the challenge of silo-busting and the rewards of putting patients first. With a team, this self-proclaimed farm boy has wrapped help around children, changing legislation so that privacy laws are not a barrier and making a difference every day. He shared that he learns by “walking around, by saying hi“, asking questions and trying new things. He knows that he needs to take care of himself so that he can “show up for them” and “work together collectively to have the best impact possible“. Those are inspiring words! He notes the importance of a team, how it is “impossible for one person to know it all but that it is important to create relationships and connect the dots“. He spoke about living in recovery, living in hope and of giving people solutions. He acknowledged that “the only person I can control is me” and that he “never had a plan but had a vision“. He spoke of keeping it simple, trust and that “doing the little things for people, go a long way“. He inspired the audience to “keep showing up“, that there is hope and finished by saying “I really haven’t done anything special” – I disagree, he is a special individual who stood up for what is right, inspired others to do the same and makes a difference in the lives of others who are experiencing abuse and mental health challenges. Sheldon might not think that he is special, but he is a hero! This entry was posted in Award, Canadian and tagged CME Guelph, Lincoln Alexander Leadership Award, MA Leadership, Sheldon Kennedy, University of Guelph. Bookmark the permalink.